EMPRO-500 purifies almost any water from a natural water source in Finland to excellent drinking and household water with reverse osmosis without chemicals. Integrated supply pump delivers clean water to the water network where it’s needed. The device can take raw water from the ocean, lake, well or other source. The device has opted to have integrated UV-cleaner. Also, larger clean water reservoir is possible. The device uses our patented technologies. 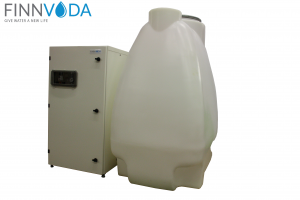 Which makes water purifying remarkably energy efficient and fully adjustment free. Compact structure and design makes the device extremely space efficient. Materials and components are tested and stated to be trustworthy. Device capacity is designed for demanding professional use. Example restaurants, cabin villages, marinas, breweries, green houses. EMPRO-500 is developed and manufactured in Finland.